Rough Edges: The Digest Enthusiast, Book Nine - Richard Krauss, ed. The Digest Enthusiast, Book Nine - Richard Krauss, ed. • Filmmaker and author Susan Emshwiller reveals the inside story on her films, the work of her parents, Ed Emshwiller and Carol Emshwiller, along with nearly two dozen rare photographs of her famous family. • Senior Art Director Victoria Green takes us behind the scenes of the art department at AHMM, Analog, Asimov’s, and EQMM, complemented by artist’s confidentials from Tim Foley and Maurizio Manzieri. • Vince Nowell, Sr. charts Ray Palmer’s digest dynasty from 1948 to 1958, followed by the bibliography of S.J. Byrne, one of Palmer’s go-to SF storytellers. • Tom Brinkmann uncovers Benedict Canyon, where Elke Sommer and Joe Hyams joined “A Neighborhood of Ghosts” from 1964 to 1969. • Steve Carper wraps “One-and-Dones” with a final, fascinating batch of obscure and/or rare collector’s treasures. • Peter Enfantino delivers a story-by-story synopsis of Manhunt from January thru June 1954. Plus a report on the rare western digest paperback, Sunset Showdownby Steve Frazee. 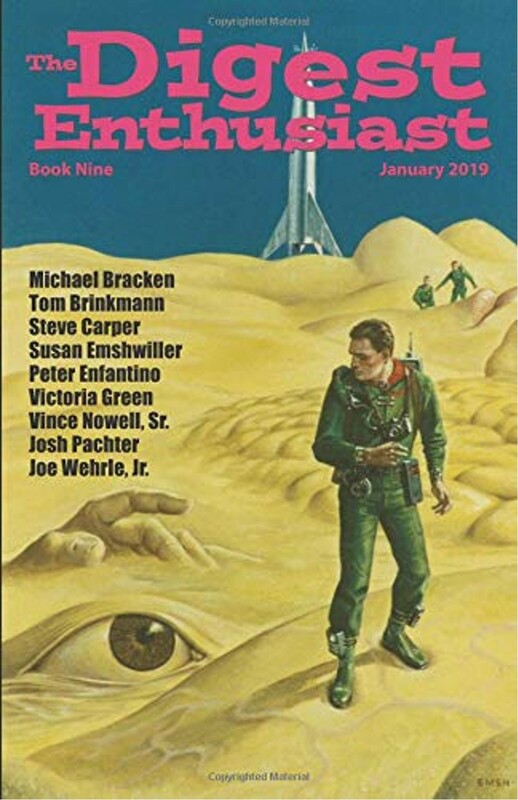 • Crime, espionage, and fantasy fiction by Michael Bracken, Josh Pachter, and Joe Wehrle, Jr., with art from Marc Myers, Michael Neno, and Joe. • News from all your favorite genre digest magazines, straight from their editors’ lips, including every newsstand stalwart, and the new generation of POD/digital stars. • In-depth reviews of EconoClash Review, Nostalgia Digest, Occult Detective Quarterly, and Hot Lead. • Plus over 100 digest magazine cover images, cartoons by Bob Vojtko and Clark Dissmeyer, first issue factoids, and more. THE DIGEST ENTHUSIAST is one of the best publications out there, and the just-released Book Nine continues that tradition of excellence. I particularly enjoyed Vince Nowell Sr.'s article about Ray Palmer, Peter Infantino's continuing coverage of MANHUNT issues (I don't always agree with Infantino's opinions on individual stories, but they're always entertaining), the piece about Steve Frazee's SUNSET SHOWDOWN, the review of the great Western fanzine HOT LEAD, and Michael Bracken's short story. There's plenty of good reading here, and I give THE DIGEST ENTHUSIAST, BOOK NINE a high recommendation. Thanks much for your support, James! If you had to pick just one back issue Of The Digest Enthusiast to recommend to someone, which one would it be? I have all 9 issues of DIGEST ENTHUSIAST and I recommend it highly to anyone interested in fiction magazines, especially in the digest format. All 9 issues are excellent but my favorites are the recent ones. I'm a long time fan of Peter Enfantino's reviews of MANHUNT magazine. I urge everyone to support this fine publication. I buy my copies from amazon.com.